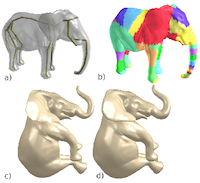 A Salience Measure for 3D Shape Decomposition and Sub-parts Classification. Thibault Blanc-Beyne, Geraldine Morin, Kathryn Leonard, Stefanie Hahmann, Axel Carlier. Graphical Models (GMOD) 99, p. 22-30, (2018). 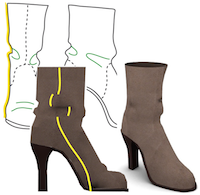 Morphorider: Acquisition and Reconstruction of 3D Curves with Mobile Sensors. Tibor Stanko, Nathalie Saguin-Sprynski, Laurent Jouanet, Stefanie Hahmann, Georges-Pierre Bonneau. IEEE Sensors (2017). Computers & Graphics, Volume 66, p.4-13 (2017). IEEE/EG EuroVis 2017, Computer Graphics Forum 36 (3), pp.23-33, (2017). Surfacing curve networks with normal control. Tibor Stanko, Stefanie Hahmann, Georges-Pierre Bonneau, Nathalie Saguin-Sprynski. Computers & Graphics 60, p1-8, (2016). A 2D Shape Structure for Decomposition and Part Similarity. Kathryn Leonard, Geraldine Morin, Stefanie Hahmann, Axel Carlier. Proceedings ICPR 2016, Cancun Mexico (2016). 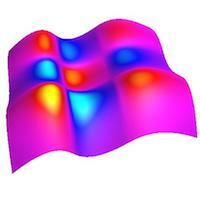 Piecewise polynomial Reconstruction of Scalar Fields from Simplified Morse-Smale Complexes. Leo Allemand-Giorgis, Georges-Pierre Bonneau, Stefanie Hahmann, In: Carr H., Garth C., Weinkauf T. (eds) Topological Methods in Data Analysis and Visualization IV. TopoInVis 2015. Mathematics and Visualization. Springer (2017). Surfacing Curve Networks with Normal Control. Tibor Stanko, Stefanie Hahmann, Georges-Pierre Bonneau, Nathalie Saguin. Computers & Graphics (CAG) 60, pp. 1-8 (2016). 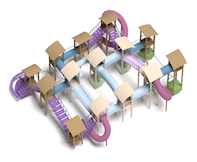 Non-smooth developable geometry for interactively animating paper crumpling. Camille Schreck , Damien Rohmer, Stefanie Hahmann, Marie-Paule Cani, Shuo JIN, Charlie C.L. Wang, Jean-Francis Bloch, ACM Transaction on Graphics (TOG) 35 (1), p. 10:1–10:18, (2015). VIDEO, to be presented at SIGGRAPH 2016. 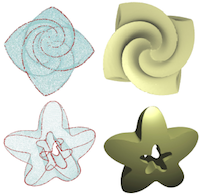 Sketching Folds: Developable Surfaces from Non-Planar Silhouettes. 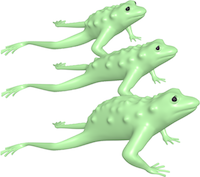 Amaury Jung, Stefanie Hahmann, Damien Rohmer, Marie-Paule Cani, Antoine Bégault, Laurence Boissieu, ACM Transaction on Graphics (TOG) 34 (5), p.155:1–155:12, (2015). VIDEO, presented at SIGGRAPH ASIA 2015. 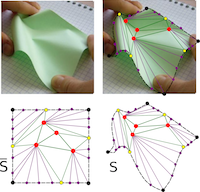 Piecewise polynomial monotonic interpolation of 2D gridded data Léo Allemand-Giorgis, Georges-Pierre Bonneau, Stefanie Hahmann, Fabien Vivodtzev: in Topological and Statistical Methods for Complex Data, Bennett, Janine; Vivodtzev, Fabien; Pascucci, Valerio. (eds. ), Springer, Mathematics and Visualization (2015). Interactively animating crumpling paper Camille Schreck, Damien Rohmer, Stefanie Hahmann, Marie-Paule Cani: ACM conference womENcourage 2015, Uppsala, Sweden, (2015). 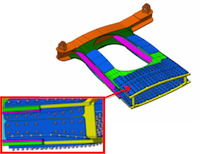 Idealized Models for FEA Derived from Generative Modeling Processes Based on Extrusion Primitives Flavien Boussuge, Jean-Claude Léon, Stefanie Hahmann, Lionel Fine: Engineering with Computers 31, p. 513-527, Springer Verlag (Germany), (2015). 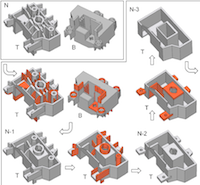 Idealized Models for FEA Derived from Generative Modeling Processes Based on Extrusion Primitives F. Boussuge, JC. Leon, Stefanie Hahmann, L. Fine 22nd International Meshing Roundtable (IMR), Orlando Josep Sarrate, Matthew Staten (eds. ), Springer, pp. 127–145, 2013. 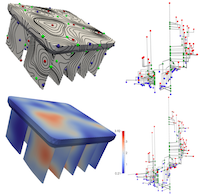 Sharp feature preserving MLS surface reconstruction based on local feature line approximations C. Weber, S. Hahmann, H. Hagen, GP. Bonneau Graphical Models 74 (6), p. 335-345 (2012). Volume preserving FFD for programmable Graphics hardware S. Hahmann, G.-P. Bonneau, S. Barbier, G. Elber, H. Hagen The Visual Computer, Volume 28, Number 3, p. 231-245 (2012). Folded paper Geometry from 2D Pattern and 3D Contour D. Rohmer, M.-P. Cani, S. Hahmann, B. Thibert Eurographics 2011, short paper, Avril 2011. 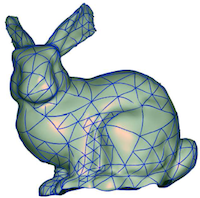 Substructure Topology Preserving Simplification of Tetrahedral Meshes F. Vivodtzev, G.-P. Bonneau, S. Hahmann, H. Hagen in Topological Methods in Data Analysis and Visualization, Springer (Ed. ), p. 55-66 (2011). 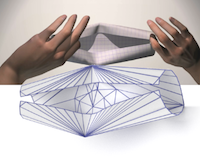 Animation Wrinkling: Augmenting Coarse Cloth Simulations with Realistic-Looking Wrinkles D. Rohmer, T. Popa, M.-P. Cani, S. Hahmann, A. Sheffer SIGGRAPH Asia 2010, Seoul ACM Transactions on Graphics 29 (6), (2010). Active Geometry for Game Characters D. Rohmer, S. Hahmann, M.-P. Cani Motion in Games (MIG’10), in Boulic R., Chrysanthou Y. et Komura T. (eds. ), Lecture Notes in Computer Science LNCS 6459, p. 170-181 (2010). Sharp Feature Detection in Point Clouds C. Weber, S. Hahmann, H. Hagen International Conference on Shape Modeling and Applications, SMI’10, p. 175-186 Aix-en-Provence, France (2010). Exact volume preserving skinning with shape control D. Rohmer, S. Hahmann, M.-P. Cani SCA’09, ACM/EG Symposium of Computer Animation 2009. Local Volume Preservation for Skinned Characters D. Rohmer, S. Hahmann, M.-P. Cani Pacific Graphics 2008 Computer Graphics Forum, Volume 27, Number 7, p. 1919-1927 (2008). Detail Preserving Deformation of B-spline Surfaces with Volume Constraint B. Sauvage, S. Hahmann, G.-P. Bonneau, G. Elber Computer Aided Geometric Design Volume 25, Number 8, p. 678-696 (2008). Volume preservation of multiresolution meshes B. Sauvage, S. Hahmann, G.-P. Bonneau Eurographics 2007, Computer Graphics Forum, Volume 26, Number 3, p. 275-283 (2007). 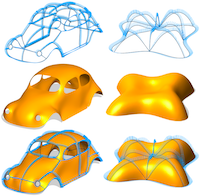 Deforming surface simplification based on dynamic geometry F. Payan, S. Hahmann, G.-P. Bonneau International Conference on Shape Modeling and Applications, SMI’07, p. 71-80 Lyon, France (2007) . 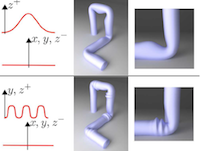 Multiresolution morphing for planar curves (Springer reference), (ACM reference) S. Hahmann, G.-P. Bonneau, M. Cornillac, B. Caramiaux Computing 79 (2-4), pp. 197-209 (2007). 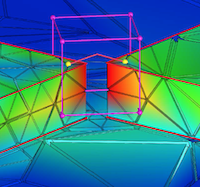 Constraint Modeling for Curves and Surfaces in CAGD V. Cheutet, M. Daniel, S. Hahmann, R. La Gréca, J.-C. Léon, R. Maculet, D. Ménegaux, B. Sauvage International Journal of Shape Modeling (IJSM), Volume 13, Number 2, pp. 159-199 (2007). Shape Interrogation – A State of the Art S. Hahmann, A. Belyaev, L. Buse, G. Elber, B. Mourrain, C. Roessl in Shape analysis and structuring, L. De Floriani and M. Spagnuolo (eds.) Springer Verlag, ISBN 978-3-540-33264-0, pp. 1-51, (2008). 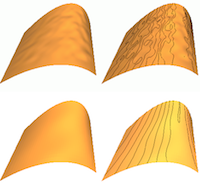 Length Constrained Multiresolution Deformation for Surface Wrinkling B. Sauvage, S. Hahmann, G.-P. Bonneau International Conference on Shape Modeling and Applications, SMI’06, p. 113-121 Matsushima, Japan (2006). Hierarchical Triangular Splines Alex Yvart, Stefanie Hahmann, Georges-Pierre Bonneau ACM Transactions on Graphics 24 (4), 1374-1391, (2005). Smooth Adaptive Fitting of 3D models using hierarchical triangular splines Alex Yvart, Stefanie Hahmann, Georges-Pierre Bonneau International Conference on Shape Modeling and Applications, SMI’05, 13-22 (2005) MIT Boston, IEEE Computer Society Press. 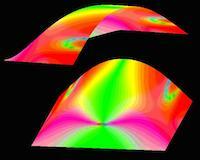 Area Preserving Deformation of multiresolution curves Hahmann S., Sauvage B., Bonneau G-P. Computer Aided Geometric Design 22 (4), pp. 349–367 (2005). Length preserving multiresolution editing of curves Basile Sauvage, Stefanie Hahmann, Georges-Pierre Bonneau Computing 72 (1-2), pp. 161-170 (2004). 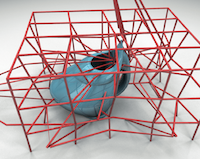 Constrained Multiresolution Geometric Modeling Stefanie Hahmann, Gershon Elber in Advances in Multiresolution for Geometric Modeling, N.A. Dodson, M.A. Sabin, and M.I. Floater (eds. ), MINGLE 2003 workshop, Springer-Verlag (2004). 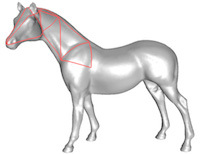 Smooth Polylines on Polygon Meshes Bonneau G.-P., Hahmann S. in G. Brunnett, B. Hamann, H. Mueller (eds. 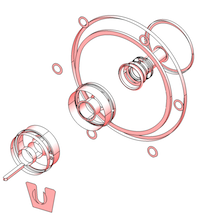 ): Geometric Modeling for Scientific Visualization, Springer, pp. 69–84, (2003). 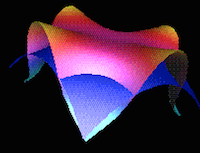 Polynomial Surfaces interpolating arbitrary triangulations Stefanie Hahmann, Bonneau G.-P. IEEE Transactions on Visualisation and Computer Graphics 9 (1), p. 99-109, (2003). 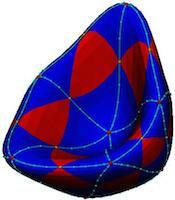 Triangular G1 interpolation by 4-splitting domain triangles Stefanie Hahmann, Bonneau G.-P., CAGD 17 (8), 731-757 (2000). Visualization techniques for surface analysis Stefanie Hahmann, in C. Bajaj (ed. ): Advanced Visualization Techniques, John Wiley, (1999). 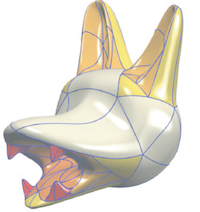 Shape improvement of surfaces Stefanie Hahmann, in G. Farin, H. Bieri, G. Brunett, T. DeRose (Eds. ), Geometric Modelling, Computing [Suppl], Vol. 13, Springer-Verlag, 1998, pp. 135-152, (1998). Knot-removal surface fairing using search strategies Stefanie Hahmann, Stefan Konz, CAD 30 (2), pp.131-138 (1998). BLAC-Wavelets: a multiresolution analysis with non-nested spaces Georges-Pierre Bonneau, Stefanie Hahmann, and Gregory M. Nielson, IEEE Proceedings Visualization’96, pp. 43-48 (1996). Visual Stability Analysis of Free Form Surfaces Stefanie Hahmann, Proceedings ISATA, Mecatronics (1995). Numerical Aspects of Stability Investigations on Surfaces Stefanie Hahmann, Hans Hagen, in Glen Mullineux (ed. ): Mathematics on Surfaces VI, pp. 291-308, (1996). 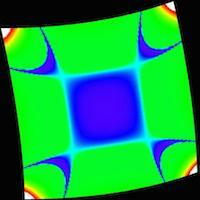 Stability Concept for Surfaces, Hans Hagen, Stefanie Hahmann, in Geometric Modelling, Computing [Suppl.] vol. 10, pp. 189-198, (1995). Visualization and Computation of Curvature Behaviour of Free-Form Curves and Surfaces, Hans Hagen, Stefanie Hahmann and Thomas Schreiber, CAD 27, (7), pp. 545-552, (1995). Generalized Focal surfaces: a new surface interrogation method, Hans Hagen, Stefanie Hahmann IEEE Proceedings Visualization’92, Boston, pp. 70–76, (1992). 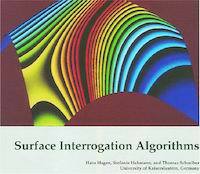 Surface Interrogation Algorithms Hans Hagen, Stefanie Hahmann. Thomas Schreiber:IEEE Computer Graphics & Applications, 12 (5), pp. 53–60, (1992).